We have a highly experienced tailors on-site at both Wandsworth and Dulwich. All garments are examined before being cleaned for any minor repairs and if found, are attended to at no extra charge to you. 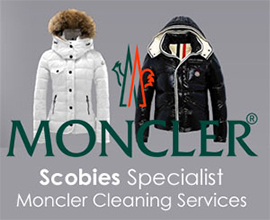 Scobies have expert fitters who will help and guide you with all the aspects of your garment alterations or repairs. Our tailors can repair: zips, re-adjust cuffs, shorten trousers, re-line garments and undertake much more. The Wandsworth branch of Scobies also offers a comprehensive range of services for Leather and Suede, including: altering, reshaping and repairs. If you are interested in a personal consultation to discuss what you would like done to a particular Suede or Leather garment, please call Scobies Wandsworth on 020 8672 3392 and arrange a convenient time for you to bring the garment in and talk personally to our specialist tailor*. *Terms and Conditions apply to our Collection & Delivery service, please contact us for more information. At Scobies, we appreciate our customers expect a premium service and require the greatest of care to be taken with their garments when they are dry cleaned or laundered. Your data is only ever used by Scobies and never passed on the third parties.